MARILLION: Garden Party 7″ Check video HIGHLY RECOMMENDED. 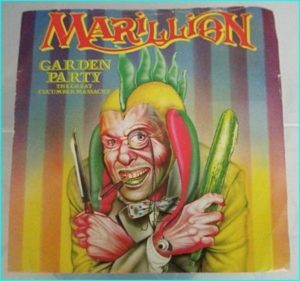 “Garden Party (The Great Cucumber Massacre)” was the third single Marillions debut album Script for a Jesters Tear, reaching number 16 in the UK Singles Chart in 1983, the bands biggest singles chart success prior to 1985. The song is a parody of social elitism and snobbery. The B-side is a live version of “Margaret” … Continue reading MARILLION: Garden Party 7″ Check video HIGHLY RECOMMENDED.